Earlier this year I was asked by my son’s school teacher if I would be interested in coming in and putting on a gardening class for the kids, or at least do something fun with the kids related to gardening. Here I saw it as an opportunity to pass along, at least a little bit, my 30 years experience to the next generation. What I received was an experience I will never forget. I arrived, with my son, at school around nine in the morning. I was told to bring along with me anything I need to conduct my lesson. With a large cardboard box in hand, filled with all the items I would need, I proceeded onto class. I was a bit nervous and anxious, but more so, because I did not want to screw anything up. The box I was carrying contained a trowel, seed starting pellets, a couple of packs of sunflower seeds, gardening gloves, plant markers, Dixie cups and 30 tomato plants, different varieties, about an inch to two inches tall. When class began, I was asked to first to read the kids a gardening book, of which the teacher had about two dozen to choose from. With the kids ages being four and five years old, I knew reading a book would definitely capture their interest, so I wanted to select something good. I chose a book that had plenty of photos so I could ask the kids questions about the objects that they saw. I believe making things interactive is the best way of getting the message across. While reading the book, I would point to an object, ask if they knew what it was and what it was used for. They immediately raised their hands in excitement to give me the answer. After reading the book I started with the first interactive gardening portion of the day and that was to show the kids how, when you add warm water to a seed starting pellet, it magically grew into dirt! The teacher chimed in at this point and asked the kids “How many of you think that if you add water to it, it will make dirt?” The kids, in their loud and cheery way were all saying no, as if to relay, there is no way he could turn this hockey puck looking item into dirt. I took one of the Dixie cups, put a seed starting pellet in it and then added some warm water to show the kids. Within a few seconds the water began to disappear and the pellet grew. Nearly all at once, the kids said “wow”, with an excited, “I can’t wait to see it again”. I then gave each child a Dixie cup and seed starting pellet of their own. The teacher went around and added the water. Visions of rolls of paper towels needed to clean up the floor had danced through her head. I don’t blame her. I have seen my own son, try to pour things at home, and at times, it didn’t go well. Within moments the kids’ seed pellets were fully grown awaiting the next step. I had decided, when I was putting my teaching plan together, that the kids would get to take a plant home. It was actually my wife’s idea to make it a sunflower. I chose the Mammoth Grey variety. When I told the kids that the sunflower could get taller than me (I am six foot, three inches tall), they loved the idea of having it grow at home to see how tall it would really get. My wife made the suggestion of the sunflower for two reasons, of which I thought of neither, and both make sense. First, it is a large seed, thereby making it easier for the kids to handle. Second, just the mere size of the sunflower when fully grown is truly awe inspiring to look at, and with the kids being that much shorter, makes the sunflower look that much taller. Each child received one seed and I gave them instructions on how to plant it in the pellet. Of course we went around the room to make sure each child’s seed was planted correctly. 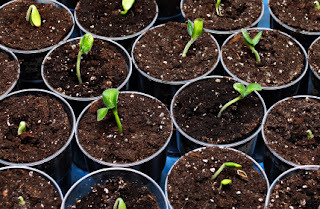 Once their seeds were planted, the teacher and the teacher’s aide had the kids come up with the seed planted Dixie cup where they were placed in plastic food storage bags, with their names written on them ready to go when it was time to leave for the day. I had previously printed up some growing instructions on four by eight sheets of paper to be included in the bags so their parents knew what to do with the planted seed once it got home. I thought it would make it much easier for the parents. Once the activity was complete, it was snack time for the kids. I began to set up the second portion of my day, getting the items ready to go plant some tomatoes in the outside school garden. I’ll save that story for my next article. A recent report was just released that by the year 2030, 42% of all Americans will be considered Obese. The findings, published in the May 8th, 2012 issue of the USA Today newspaper, claims that 32 million people will become obese in that time. Very scary news. However, we do have the ability to make some small lifestyle changes that can hopefully turn the study’s trend in the other direction. Sure, adding some simple exercises to your daily routine will definitely help, but you also have to eat healthy otherwise your body won’t get the fuel it needs. So how can we put your vegetable garden to work for a healthier you? Leafy greens such as Kale and Spinach are great choices for anyone’s nutrition plan. They are, as Dafna puts it, “nutritional powerhouses”. With their high contents of iron, calcium, vitamins C, A, E, folate, and water content, who can argue. They are also very versatile when it comes time to prepare them for meals. “The traditional use is as a salad base but they are also great in omelets, soups and even meatballs or just sauteed with garlic and olive oil,” continues Dafna. They are also easy to grow in many parts of America, as they are a cooler weather crop and can be easily grown in cold frames in the winter months. Root crops can be some of the easiest crops to grow and maintain, however, your soil should be loose and friable to make sure that the root can easily expand and grow. Soil with a high clay content may make it too compact and ultimately stunt growth of such crops. If you are looking for a healthier you and you do not want to be a part of that stat come 2030, then be sure to make some room for those leafy greens and your favorite root crops. That combined with the extra exercise you will get by maintaining your garden will at least be a start to a healthier you. All Your Seeds Germinated, Now What do You do? 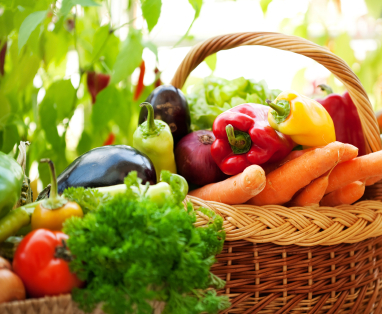 It’s that time of the year when you begin planting your vegetable seeds. If you are like me then you start them indoors long before the outdoor temperatures are high enough to sustain any form of life, let alone plant life. 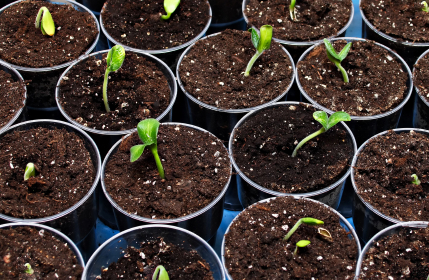 And because you start your seeds way in advance you want to make sure that you plant plenty of them to ensure that you will get many of them to germinate, yielding enough plants for the upcoming vegetable gardening season. You get your starter pots ready, add in your potting soil of choice, take a pinch full of tomato seeds (about 10 per pinch) and add them. You then lightly cover with just a little more soil for good measure, and then place the final starters in your propagation dome. About a week later you check on your starters and uh oh, problem, all of the seeds germinated, now what? While I would not consider this a major problem, this can be a bit aggravating. Aggravating because you sit and wonder if you could have used less seeds to accomplish your original goal. You are now left with enough plants, once thinned out, to supply your neighborhood. So what do you do with them? I have offered up some suggestions below. I am sure you have heard of seed swaps. They are events, even websites and Facebook pages where you meet up with other vegetable gardeners to, as you might guess, swap seeds. A plant swap works the same way, except most, if not all I know about, are done in person. You bring your extra plants as do others and you start trading. You can check for plant swaps in your area by doing a Google search as there are many clubs and organizations that partake in them. Plant swaps are growing in popularity, so keep an eye out for them. This is an obvious option, but one that is overlooked. I have a few neighbors that have really gotten into vegetable gardening and are just starting out, so I am able to pass along a few plants. You may be able to as well. These are becoming extremely popular in many areas of the world. Vacant pieces of land in many municipalities are being transformed into edible landscapes. Community gardens are a great source to donate or even sell your extra plants to. With so many gardeners in one place, you may be able to unload all of your extras. My son’s school has a great gardening program. His school has about a quarter acre of land set aside to grow many things. They have a butterfly garden, a lot of perennial flowers, as well as various raised beds for fruits and veggies. The idea is to get the students excited about gardening and teach them some things along the way. I have gotten to know the person that operates the gardening program and I know she is always looking for plants, seeds, potting soil etc, as their budget is limited. I am sure you have something similar in your area. Don’t be afraid to call around or even shoot off an email to your child’s school teacher, or to someone within any type of local organization (think Boy Scouts, 4-H, Girl Scouts etc.). Don’t forget co-workers or given as special gifts. You can transplant them into bigger, inexpensive pots and offer them up for Mother’s Day, Father’s Day and so on. While not everyone wants a full blown vegetable garden, by giving them just a single extra plant of yours, may be all the motivation they need to move into that direction.